Incoterms are the official International Chamber of Commerce (ICC) rules for the explanation of trade terms. Incoterms are adhered to by all major trading nations of the world, and it is the authoritative text for determining how costs and risks are allocated to the parties conducting international transactions. They facilitate the conduct of international business by defining the responsibilities of the involved participants. This is the fourth article in our series investigating the basic meaning of all 11 Incoterms. (Read about the first three Incoterms here: FCA, DAP, and DDP.) The Incoterm we’re discussing today is Carriage Paid To, also known as CPT. What Does the Carriage Paid To (CPT) Trade Term Mean? When Can CPT Be Used? 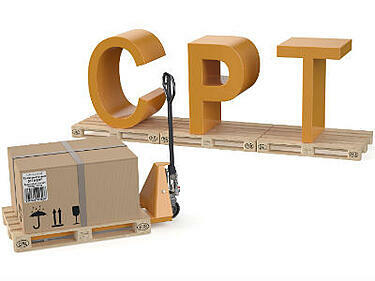 CPT can be used for any transport mode—air, courier, truck, rail, vessel or multi-modal. Unlike other terms, CPT divides the responsibilities for transportation and risk for goods between two points.